Jack Reacher (Tom Cruise), an ex-major in the US army’s military police, is drawn back into the fold when former colleague Major Susan Turner (Cobie Smulders) is arrested for espionage. After investigating the incident, Reacher himself is framed for the murder of an army colonel. He and Turner break out of custody to bring down the real killers and uncover a criminal operation undertaken by a private military contractor in Afghanistan. 2012’s Jack Reacher was a relatively modest but underrated action feature from director Christoper McQuarrie; one that cast Tom Cruise against type as author Lee Child’s popular fictional vigilante. It was not a significant commercial hit, but earned just enough for Paramount Pictures to bankroll a 2016 follow-up. McQuarrie – who had moved on to writing and directing for Cruise’s Mission: Impossible franchise – was replaced by Edward Zwick (The Last Samurai). Cruise returned. The end result, however, turned out to be a crushing disappointment. 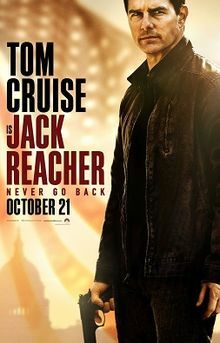 The problem with Jack Reacher: Never Go Back is that it is mediocre. There’s nothing worse. A genuinely poor film can be disregarded or dismissed, or even enjoyed in a certain mocking fashion. Never Go Back is never so awful to allow mockery. It simply sits on the screen in a deeply ordinary and inert fashion. It does not bring any new ideas to the table. Its action is generic and by-the-numbers. Its characters are two-dimensional cyphers for an overly familiar story. When it is at its strongest, it is just repeating the strongest beats of the previous film. The bottom line is that when Paramount required an edgy and bluntly violence slice of pulp entertainment they got an extra-length episode of a CBS crime show. There is no reason for people to watch this film; honestly, any made-for-television movie would do. There are several reasons why this is probably so, but the main one has to be the hiring of Zwick as director and co-screenwriter. Zwick has his strengths, but they are mostly his ability to shoot widescreen vistas with lush period settings. He had previously worked with Cruise on The Last Samurai (2003), and had created some attractive visuals for the likes of Legends of the Fall (1994) and particularly Glory (1989) – still his best work. The urban environment of Washington and New Orleans in which Never Go Back takes place is a poor fit. It robs Zwick of his greatest strength and leaves him with material to which he simply doesn’t seem suited. The screenplay is terribly cliched. Anybody who cannot guess the plot before it occurs simply cannot have seen more than two or three of these kinds of films. The dialogue is ordinary. Nothing sparks. There is a teen sidekick whose simply presence drags things down. It is a chore to sit through most of the dialogue, and when people start punching each other it feels dreadfully generic. To his credit, Cruise still gives maximum effort. He has much too small a physique to come close to matching the literary Reacher (as any Lee Child enthusiast will be happy to tell you), but he has an intensity and a bluntness to his performance here that happily compensates. Co-star Cobie Smulders is excellent as Turner; she is under-used by Hollywood in many respects, and to the film’s credit her character is sensibly used and mostly presented on an even level with Reacher. The film does dabble a little with romantic scenes between the stars, but mainly keeps things professional – the film feels more authentic the less romantic it gets. Tom Cruise will always give a film a certain degree of entertainment value, but a few of his co-stars aside it really does feel as if nobody else had an ounce of enthusiasm for making it. There was a hell of a lot of potential in a Jack Reacher franchise, and the first time around they mostly did a great job. The franchise ends here, however: there isn’t going to be third chance for mediocrity.